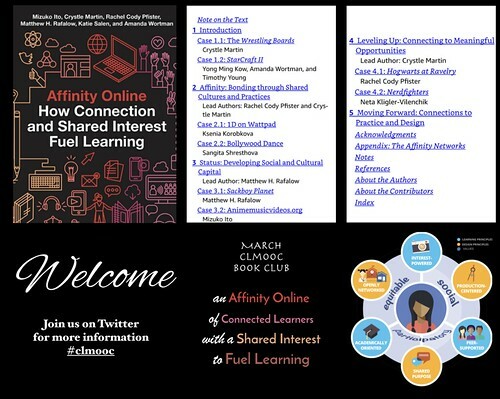 Thanks to Terry for popping the last full chapter in the book Affinity Online: How Connection and Shared Interest Fuel Learning, being read by CLMOOC as a month-long book study, for some crowd annotation into NowComment. Like Hypothesis, NowComment allows for many people to be reading and commenting and engaging in conversations on a single text. This chapter — entitled Moving Forward — has the researchers bringing the strands of earlier chapters together in a helpful narrative. You can join us even if you haven’t read the book. There are many pathways into the text, too, which we have outlined at the CLMOOC website. But you are invited …. I am going to try the embed version here, too. Networked Narratives held another of its regular Studio Visits earlier this week as the theme of the online course with an open invitation (allowing me and others to join in) shifts from the darkness of the web and technology to the light and the possible. Things are going from negative to positive. 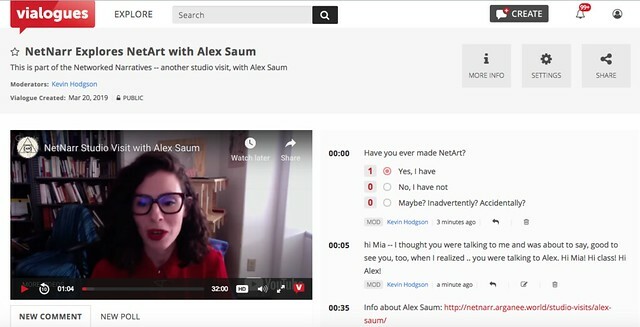 Here, Alex Saum is the guest, and she has been exploring the world of NetArt, or the leveraging of technology platforms to explore the notions of art. This topic is something I have long been interested in (see Blink Blink Blink as an early experiment), so I popped the video into Vialogues so I can slow-watch and think out loud in the margins. You are invited to join me, too. I hope you do. In the past few days, thanks to the folks in the #clmooc book study and the authors of the book — Affinity Online: How Connections and Shared Interest Fuel Learning — which we are reading to better understand networks of shared interests, there have emerged a number of different entry points for reading the book and engaging in conversation with us. You can now access the entire book for free online as a digital text, thanks to the publisher and writers. I don’t think you can download a copy nor can you annotate it with some of our annotation tools. Still, it is kind of them to give readers access. You can read the first chapter of the book as a PDF and with Hypothesis. 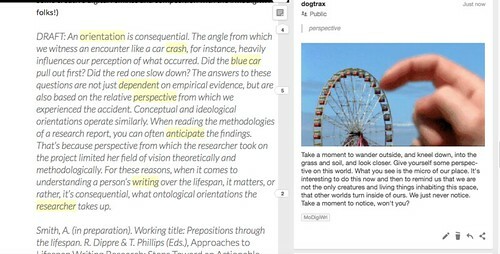 Hypothesis is an easy add-on tool to use, and provides a place for conversation with a text and with other readers. You can use Hypothesis crowd annotation tool to annotate with us an excerpt from the text that is at the Connected Learning Alliance site. There is already a conversation blooming there. You can read part of the book over at another annotation tool called NowComment. Terry has set up the text, but it will require a free account with NowComment. Terry has also set up Chapter Five (Moving Forward) in NowComment. Perhaps the last full chapter is a good gathering place for us all, to read together and to think together. You can annotate a video introduction of the book itself, in which lead researcher Mimi Ito gives some context for the studies, the stories and the ideas of Connected Learning. We are using Vialogues as a way to annotate video. You can just follow along with other readers in the #clmooc Twitter thread, where quotes and questions and comments are flowing on a regular basis. You can read and follow some of the readers blogging about the book — such as Sheri and Terry and Daniel and Sarah and others, such as myself — to use the comment area to ask questions, push back on thinking and wonder out loud. Put them in your RSS feed, if you still use RSS, and if you don’t, you should! See you on the pages! Anna wrote a blog post, rewriting an introduction to a book. I used words from her post, from her remixed introduction, to spark small essays in the margins of her post. Only one essay connects back to her writing. The rest are riffs into someplace else altogether. I’m curious what this kind of margin, off-centered writing does to the original piece. Are these offshoots mere distractions, particularly given they don’t thematically connect? Or are these blooms, taking root from the original, giving another context to the word choices that Anna made? Is the reader in me, interpreting? Or the writer in me, adding personal perspective? What role does the reader bring to a text as a writer? Why did I add images? Do the images distract or enhance the writing? What does it mean that I wrote this all in the margins of Anna’s text, and that you may never have seen it if I didn’t leave links scattered about? Does that kind of marginalized writing still have meaning? I could not attend NCTE annual converence this year for reasons related to the ways the federal government has withdrawn most of its support for the National Writing Project, but I have been following some of the threads on Twitter when I could over the weekend. In particular, I was curious about the work being done by my friends via Marginal Syllabus with annotations and margin writing. I could not help myself. As I saw people working on a hallway activity of making and then tweeting out notes on cards with quotes on Saturday, I started to make margin notes on the notes of the margins from here at home, and sharing them back into the stream. For a bit of time, it felt like I was there, with them. And this is the link to their presentation slides. First, I grabbed a screenshot and used the text and arrow tools. Then, I used an app that lets you manipulate an image, and used the idea of the margin at the center as symbolic concept. Another one used a favorite: comics to make comments. And then, I found a poem in an annotation. Thanks to Adam, Sam, Jessica and Carolyn for letting me play with their work. I hope the workshop for the digital annotation was an interesting and illuminating session. Knowing the folks running it, I bet it was. This is the digital annotation workshop for WMWP’s Best Practices. While this is here for participants in the workshop itself, anyone else who might be visiting (hello to you) is free to explore and join us, too. Although, the first part — where we write on paper — might prove trickier for you than for us. Tomorrow, I am leading a workshop at the Western Massachusetts Writing Project about digital annotation (and a second one about Write Out and place-based learning). My frame is to have them first work with the text on their own, with pen and notes in the margins of their copies of paper; and then together as a workshop group, marking up the text with sticky notes; and then online with the world, using Hypothesis to make connections with the text and others. 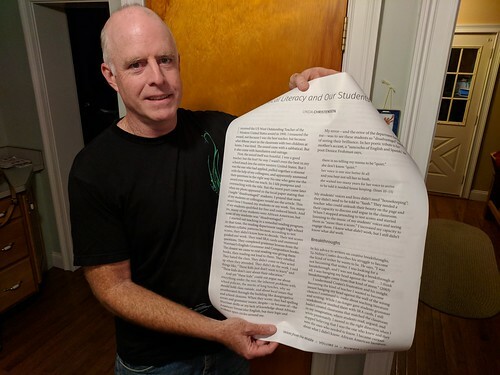 I took the Christensen article we will be using — a powerful piece about critical literacy and paying attention to students by Linda Christensen — and blew it up into poster-sized pages. For the second phase of the workshop — annotating as a small group — we will use these over-sized pages and sticky notes. The article was part of a Writing Our Civic Futures activity last year. You will be able to see the slideshow for the workshop here tomorrow, since I am going to embed it for participants to use for links and such. As part of my annotation of War in Translation for Equity Unbound, I found a sentence/passage that lent itself to a poem, so I wrote in the margins of the piece. Later, I took the poem and created this video version, which I think is powerful for the combination of words, image and music. In the considered, deliberate act of translation, these I’s bump up into one another again and again until they are accidentally shattered, the various pieces of these commingled selves becoming, for long moments, indistinguishable from one another. There’s a moment of realization upon reading “War in Translation: Giving Voice to the Women of Syria” by Lina Mounzer when her opening stories of anguish and war and struggle give way to the realization that she is writing in a collective voice. I found myself jolted (although, to be honest, if only I had spent more time reading the title of the piece, perhaps I would have better realized the situation). 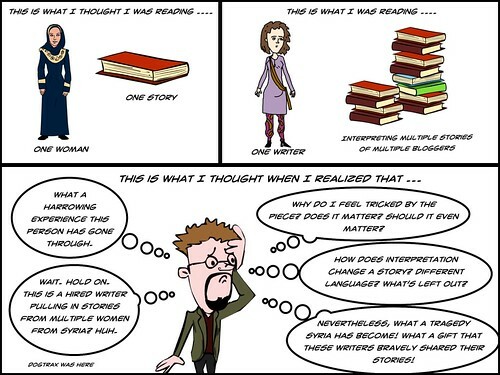 But it did get me thinking about the role of the single reader experiencing a collective story. In this case, Mounzer is distilling the stories of multiple women in Syria who blogged about living in a state of war, and how it impacted their families, their lives, their futures. Her role was as translator, and also as curator of collective voices. Her intention was to give voice to the struggles of women in Syria, and she succeeds. So what is my role, the reader removed from the scene, in this story? These are some rough thoughts this morning, before I head back into the text for more reading. A reader must determine veracity. We live in the age of Fake News and Unreliable News. I did my due diligence by following the biography of Mounzer and her organization, and determined as best as I could that she seemed to be who she says she is, and that I could believe in her work. This is key to a collective story format like this, as a curator and translator could easily invent stories to make a point. The ‘multiple voice’ format is easily manipulated by a writer. That does not appear to be the case here. I believe these stories. A reader must be willing to be transported. Aleppo is far from my home. I am in a comfortable, and safe, space as I read about these brave women trying to survive under a brutal regime and violent revolution. As reader, I must try to make their stories present in my head and in my heart. I must try to understand. In this case, the act of crowd-annotation is helpful, for it forces the reader to interact with the text on a meaningful level. I can’t ignore the stories. I have to acknowledge them. A reader should find other readers. This may not be true in all cases — there are plenty of pieces I read alone and never share with anyone — but here, in a piece about collective voices that comes within a theme about avoiding “the single story,” it seems rather important that readers gather together to read together. The use of Hypothesis helps this. The reader is not alone, as the Syrian bloggers are not alone. As Mounzer brings the writers together, so does Hypothesis and Equity Unbound bring readers together. A reader brings themselves and their own stories into the texts. I am thinking of how engaging with the text from other people from other parts of the world has the potential to expand my own understanding of the world. One’s perspective of Syria from the United States is likely different from the perspectives of someone from the Middle East, I suspect. This is because we have different stories to tell, and different ways to make connections to the story of stories we are reading together. I’m not talking about sharing intimate experiences with the world, with people we don’t really know. But readers bring where they were to where they are, and reading other readers is powerful. When the reader becomes writer, the writer knows they are being read. Sorry for the tricky phrasing, but I was thinking of how the annotations would be received by Mounzer, and if she would find a way to send those comments forth to the women bloggers she has curated. I can visualize this loop, from stories, to curation, to article, to readers, to annotation, to comments, to stories, to writers. Those bloggers needed an audience. They used writing to make sense of an unpredictable world. A world of sadness and violence. We are their audience. You are their audience. Annotation makes the reader visible. What do you think? What’s the role of the reader in any text? 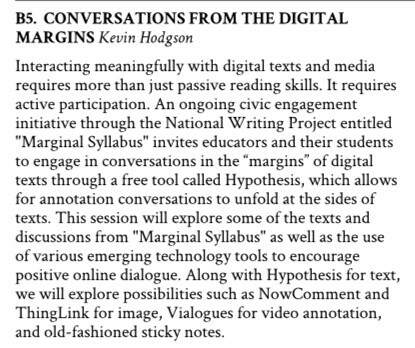 At an upcoming October 13 conference for our Western Massachusetts Writing Project, I am facilitating a workshop session around digital annotation, with technology like Hypothesis and NowComment and with sites like Marginal Syllabus and Educator Innovator in the mix. My aim with my session — Conversations from the Digital Margins — is going to be to work sequentially on a single article — moving from single copy/pencil notes, to workshop wall copy/sticky notes, to online annotation. So, from solo to group to crowd. I’m still thinking through the way I envision the workshop unfolding and am mulling over which article from last year’s Writing Our Civic Futures project that I want to pull into my workshop. What I find interesting is that the participants of my session will be in “conversation” in the margins with participants of the annotation event from last year. The discussion will continue …. If you are a Western Massachusetts educator, we invite you to register for the Saturday October 13 conference, which features many workshops from WMWP teacher-consultants and a keynote address by a WMWP alumni, Kelly Norris, whose book — Too White: A Journey into the Racial Divide — has just come out. Last year, we had Sydney Chaffee, a teacher of the year, as our speaker.